Samuel Pierpont Langley, who was the first recipient of the medal in 1886 "for numerous investigations of a high order of merit in solar physics, and especially in the domain of radiant energy"
The Henry Draper Medal is awarded every 4 years by the United States National Academy of Sciences "for investigations in astronomical physics". Named after Henry Draper, the medal is awarded with a gift of USD $15,000. 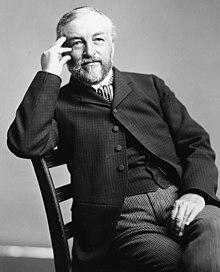 The medal was established under the Draper Fund by his widow, Anna Draper, in honor of her husband, and was first awarded in 1886 to Samuel Pierpont Langley "for numerous investigations of a high order of merit in solar physics, and especially in the domain of radiant energy". It has since been awarded 45 times. The medal has been awarded to multiple individuals in the same year: in 1977 it was awarded to Arno Allan Penzias and Robert Woodrow Wilson "for their discovery of the cosmic microwave radiation (a remnant of the very early universe), and their leading role in the discovery of interstellar molecules"; in 1989 to Riccardo Giovanelli and Martha P. Haynes "for the first three-dimensional view of some of the remarkable large-scale filamentary structures of our visible universe"; in 1993 to Ralph Asher Alpher and Robert Herman "for their insight and skill in developing a physical model of the evolution of the universe and in predicting the existence of a microwave background radiation years before this radiation was serendipitously discovered" and in 2001 to R. Paul Butler and Geoffrey Marcy "for their pioneering investigations of planets orbiting other stars via high-precision radial velocities". ^ a b c d Scientific American. Scientific American Inc. 1887. p. 208. ^ a b c A History of the Half-Century of the National Academy of Sciences 1863-1913. Committee on the Preparation of the Semi-Centennial Volume. 1913. p. 346. ^ a b c "Henry Draper Medal". United States National Academy of Sciences. Retrieved 2015-08-11. ^ a b "National Academy of Sciences Honors NASA's Neil Gehrels for Science Contributions". NASA. Retrieved 2011-05-28. ^ a b "Academy Honors 17 for Major Contributions to Science". United States National Academies. Retrieved 2011-05-28. ^ a b Wilson, H.W. (1987). Nobel prize winners: an H.W. Wilson biographical dictionary. p. 1140. ISBN 978-0-8242-0756-4. ^ a b Todd, Deborah; Angelo, Joseph (2005). A to Z of scientists in space and astronomy. Infobase Publishing. p. 232. ISBN 0-8160-4639-5. ^ a b Rubin, Vera (1997). Bright galaxies, dark matters. Springer. p. 202. ISBN 978-1-56396-231-8. ^ a b Yount, Lisa (2006). Modern astronomy: expanding the universe. Infobase Publishing. p. 152. ISBN 978-0-8160-5746-7. ^ a b American journal of numismatics, and bulletin of American numismatic and archæological societies. 28. T.R. Marvin & Son. 1894. p. 78. ^ The Popular Science Monthly. Bonnier Corporation. 1901. p. 90. ISSN 0161-7370. ^ Todd, Deborah; Angelo, Joseph (2005). A to Z of scientists in space and astronomy. Infobase Publishing. p. 174. ISBN 0-8160-4639-5. ^ Yount, Lisa (2006). Modern astronomy: expanding the universe. Infobase Publishing. p. 7. ISBN 978-0-8160-5746-7. ^ Todd, Deborah; Angelo, Joseph (2005). A to Z of scientists in space and astronomy. Infobase Publishing. p. 74. ISBN 0-8160-4639-5. ^ A History of the Half-Century of the National Academy of Sciences 1863-1913. Committee on the Preparation of the Semi-Centennial Volume. 1913. p. 98. ^ The semi-centennial anniversary of the National academy of science. United States National Academy of Sciences. 2000. p. 70. ^ Porter, Roy (2000). The Biographical Dictionary of Scientists: Lebedev to Zworykin. Oxford University Press. p. 876. ISBN 978-0-19-521665-3. ^ Wilson, H.W. (1987). Nobel prize winners: an H.W. Wilson biographical dictionary. p. 700. ISBN 978-0-8242-0756-4. ^ Todd, Deborah; Angelo, Joseph (2005). A to Z of scientists in space and astronomy. Infobase Publishing. p. 7. ISBN 0-8160-4639-5. ^ Nature: a weekly journal of science. 157. Nature Publishing Group. 1946. p. 362. ^ Osterbrock, Donald E. (1993). Pauper & prince: Ritchey, Hale & big American telescopes. University of Arizona Press. p. 149. ISBN 978-0-8165-1199-0. ^ The Knickerbocker: the magazine of the low countries. 3. The Atlantic Observer. 1943. p. 59. ^ Todd, Deborah; Angelo, Joseph (2005). A to Z of scientists in space and astronomy. Infobase Publishing. p. 249. ISBN 0-8160-4639-5. ^ Douglas, Allie (1956). The life of Arthur Stanley Eddington. Nelson. p. 127. ^ Todd, Deborah; Angelo, Joseph (2005). A to Z of scientists in space and astronomy. Infobase Publishing. p. 261. ISBN 0-8160-4639-5. ^ Popular Astronomy. Carleton College. 1928. p. 380. ^ Gregersen, Erik (2009). The Universe. The Rosen Publishing Group. p. 170. ISBN 978-1-61530-055-6. ^ DeVorkin, David H. (2000). Henry Norris Russell: dean of American astronomers. Princeton University Press. p. 297. ISBN 978-0-691-04918-2. ^ Hodgson, J. H. (1945). Geological Survey of Canada, Open File 1945. Natural Resources Canada. p. 143. ^ "New Scientist" (Dec 20–27). Reed Business Information. 1979: 956. ISSN 0262-4079. ^ The command of light: Rowland's school of physics and the spectrum. 238. American Philosophical Society. 2000. p. 207. ISBN 978-0-87169-238-2. ^ Sky and Telescope. 2. Sky Publishing Corporation. 1942. p. 338. ^ Year Book. 60. Carnegie Institution of Washington. 1960. p. 53. ^ Biographical Dictionary of Great Astronomers. 60. Sura Books. 2007. p. 25. ISBN 978-81-7478-697-5. ^ Osterbrock, Donald E. (1999). Yerkes Observatory, 1892-1950: The Birth, Near Death, and Resurrection of a Scientific Research Institution. University of Chicago Press. p. 295. ISBN 978-0-226-63946-8. ^ The Australian journal of science. 16. Australian and New Zealand Association for the Advancement of Science. 1952. p. 22. ^ International Who's Who (63 ed.). Europa. 2000. p. 724. ISBN 978-1-85743-050-9. ^ News report. 8. United States National Research Council. 1955. p. 36. ^ Notable Scientists from 1900 to the Present: A-C. Gale Group. 2001. p. 97. ISBN 978-0-7876-1752-3. ^ McGraw-Hill modern scientists and engineers. 3. McGraw-Hill. 1980. p. 88. ISBN 978-0-07-045266-4. ^ McGraw-Hill modern scientists and engineers. 3. McGraw-Hill. 1980. p. 226. ISBN 978-0-07-045266-4. ^ Science and its times: understanding the social significance of scientific discovery. Gale Group. 2000. p. 453. ISBN 978-0-7876-3939-6. ^ International Who's Who. International Publications Service. 1984. p. 377. ISBN 978-0-905118-86-4. ^ Murty, K. Krishna (2005). Spice In Science. Pustak Mahal. p. 136. ISBN 978-81-223-0900-3. ^ Todd, Deborah; Angelo, Joseph (2005). A to Z of scientists in space and astronomy. Infobase Publishing. p. 581. ISBN 0-8160-4639-5. ^ International Who's Who (1991-92 ed.). Europa. 1991. p. 454. ISBN 978-0-946653-70-6. ^ Lanzerotti, Louis J.; National Research Council (U.S.). Committee on the Assessment of Options for Extending the Life of the Hubble Space Telescope (2005). Assessment of options for extending the life of the Hubble Space Telescope: final report. National Academies Press. p. 142. ISBN 978-0-309-09530-3. ^ Stern, Alan (2001). Our universe: the thrill of extragalactic exploration as told by leading experts. Cambridge University Press. p. 89. ISBN 978-0-521-78907-3. ^ Colloquium on the Age of the Universe, Dark Matter, and Structure Formation. National Academies Press. 1998. p. 87. ISBN 978-0-309-06026-4. ^ "Brief Biography of Charles L. Bennett". Johns Hopkins University. Retrieved 2011-05-28.